Winter stretches itself to the breaking point in the north country. Inch into February, and signs of breakage appear here and there, including the blessed lengthening of days. Another of the signs, easy to miss, is in a little wood-sided building off a dirt alley in Missoula’s University District. Pick a Thursday evening in February. You could stand at a distance like a biologist, hear the rumbled hiss of an electric kettle, observe the accumulation of bodies into this warm, lighted space, filling up the neat rows of folding chairs, and quieting down to listen as one to a well-wrought story. To be transformed, or transported, or transfixed, by someone’s story. All of this for an hour or so of environmental writing. 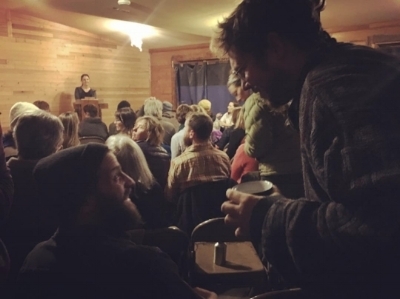 Wild Mercy comes every year like the seasons, and some of us look to the arrival of the reading series like we do the return of sunlight to our evenings. Consider for a second, if you will, the concept of “environmental writing.” What images might those two words command in your mind? Probably something to do with mountains, perhaps a river flowing through it all, scattered clumps of wildflowers, maybe - in some very rare cases - an arid prairie. If these shopworn images were all that were at stake, you could bet those seats wouldn’t be half as full as they tend to be come 6:30 PM on a given Thursday. That’s because there’s a lot more on the line than just aesthetics and yuppie insight; writers are putting their very souls on the block. This is what brings the people, week after week. Is that a little hyperbolic? Sure it is. Sometimes hyperbole is close to truth, however. There’s a mutuality, a sharing of humanity, that takes place in a room where someone lays out their individual version of truth, with their own color, observations, trials and triumphs, to punctuate it. Throw in a corresponding sea of eyes and ears attuned to that individual frequency; it becomes less individual, more universal. Space and time tend to both collapse and expand, where everything that matters is immediate, as if the whole world is contained in that tiny space of the reading room. So far in 2018, we’ve gone pretty far afield through the voices of our writers, and contained in that small, cozy room, we’ve gone there together. Emma Pfieffer brought us to the Statue of Liberty; Matt Hart, to the other edge of the Western world, Alaska. In between those poles, Rachel Dickson and Danielle Latuga kept us at home in Montana, and Mason Parker planted us in Oklahoma, right in the center of this ambiguous mass of land we call a country. We’ve learned that “a built environment is also an environment,” that “without access [to wilderness] there is no support,” and, in the words of Danielle Latuga, we’ve entered into spaces “where inner and outer landscapes meet and diverge.” A lot can happen in an hour. You ought to come and see for yourself; you won’t be disappointed. These words by the inimitable Terry Tempest Williams are invoked at the start of each reading, an incantation or a call to bear witness, like the sound of a tolling bell. It sets a tone. I think of another idea espoused by Williams, that of “radical empathy,” the power of stories to collapse divisions and open pathways to interpersonal recognition. To file into a converted garage and sit on metal chairs shoulder-to-shoulder with complete strangers, in order to be swayed and enchanted by stories: all of us who do this regularly surely must have faith in that power, and a willingness to be changed, for the better, by someone else’s story. Show up to Wild Mercy often enough and the people you sit next to won’t remain strangers for long. All this talk about stories, I’m reminded of another quote. Spend any appreciable time around the literary set, and Joan Didion's words will inevitably arise: “We tell ourselves stories in order to live.” It seems funny to include here, because it’s not in short supply anywhere, but there’s a good reason for that. It sits with you like a line of the best poetry, like a stone you keep in your pocket and turn over and over to feel all of its details. Kind of like the best stories, come to think of it. We do indeed tell ourselves (and each other) stories, in order to live. Some parrot the claim that we are now in a “post-truth” era. I’m here to say that truth is alive and well, and you can find it wherever a genuine and heartfelt story is being told.